Hello, I'm Jackaal, leader and one of the alphas of Sakura Tribe. On wolfquest, all is well summarized and described, but I advise you to read all the rules and topics of the site as well, to make sure you will knowing about everything that I didn't write on the thread, like images of the territories etc. If you are in EFA PM me, just to make sure if you have not updated your profile on the site. If you have questions about anything, post a topic in 'help' forum on the site (read 'help' rules first). About site accounts, only one per user by now. I'm not sure if you can manage all of them, so to not fill the site with inactive accounts you only will be able to create one account. 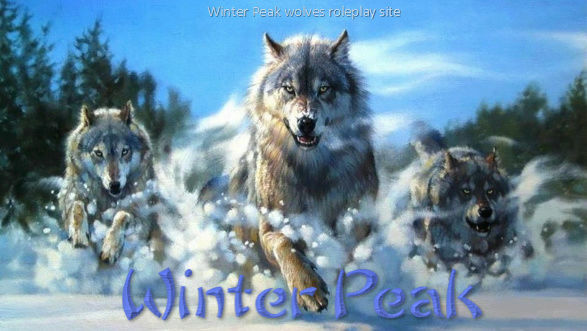 About wolfquest accounts PM me if you transferred your account or change the username. Now about site chats. There is a 'chat' forum and the 'chat' itself. You can use both, but the 'chat' forum is only for specific subjects, except the topic of 'general discussion', but in this topic you can't refer to only a one person. In the 'chat' itself, you can talk about any subject (except subject involving +PG-13 content) with anyone, but remember that personal subjects you must use PMs. For any questions that are not addressed above, post a topic on site 'help' or contact me directly via PM on wolfquest or on our site and if you are a visitor send me an email that can be found on my profile. Now basic information of the character in the profile are required. Go to the tab 'mini bio' on your profile editing and fill your character information. Everyone should fill it and characters that haven't put biographies will be blocked if they not do that. This is for administrators to know which users are actually in roleplay and to quickly access of the characters information.